I started this blog to share some projects, the most important of which became the conversion of the iMac G4 to something that could be used with a modern day processor. The PowerPC processor went from being slow to obsolete to essentially unusable, which relegated the most elegant desktop computer I've ever used to little more then a showpiece. As I progressed, I wrote this blog as an experience journal. I tried several different approaches (probably around 20) and had some success with 9 different methods, these are detailed in my Summary of iMac Mods post. But, many of these are clearly inferior and more difficult then others. Some are even potentially dangerous and I've kept those posts up only for historical purposes. Several posts are even dead ends that were not viable at all. As a result, this blog can be quite difficult to navigate for those trying to perform this mod. To help with this, I am writing this post to point those looking to do this in the right direction. I am thrilled to see that many people remain interested in this computer and this mod and I hope this post will help make the information contained in this blog easier to follow. 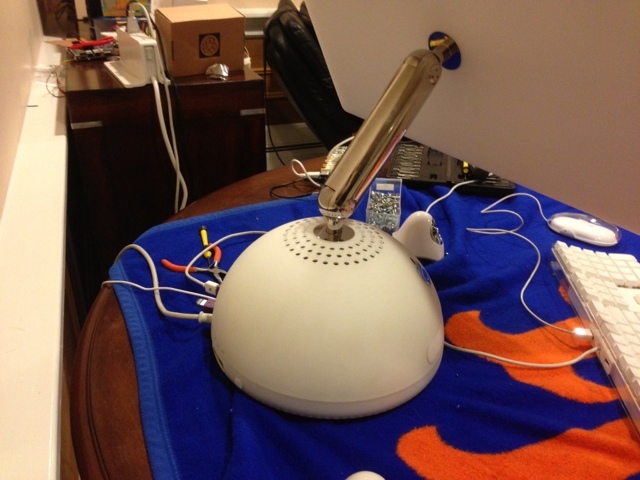 The iMac G4 has one feature that makes it extremely difficult to mod, the neck. As this is the feature that gives it its defining characteristic, it can not be eliminated or bypassed. The neck is difficult to open and barely has enough room for the remarkably thin wires that Apple has already passed through it. The G4 was designed as an all-in-one in two compartments and works unlike any other computer before or since. Some components usually found outside the LCD are actually inside of it and certain components usually found paired with LCD screens are pulled out and found in the base (the power supply or Motherboard itself). This made getting a video signal from a different CPU and motherboard through the neck and to the existing monitor difficult. My goal was always to find a reproducible way to make the screen compatible with a standard video input signal which terminates in the base. 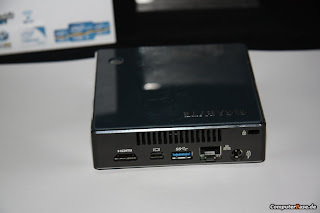 Though, an all-in-one was not overly important to me (I currently use it daily as an external monitor with a Mac Mini) I did go on pair it with several small form factor boards as an all-in-one, the best of which was a Intel NUC. Next are the hyperlinks to the posts that I believe represent the best ways to do this mod for the different models and sizes. A Summary and the PROS/CONS of all the G4 mods that I have performed over the years. Although most of these I no longer would recommend, they may still prove valuable to someone and the above hyperlink is where you will find them. These range from an all-in-one with Intel NUC in the base to a black paintjob on the base and an alternate black monitor attached to the neck to incorporation of parts from an Apple Cinema Display. The most important information needed to perform this mod is the pinout of LCD wires originating from the neck. Because the iMac G4 uses TMDS signaling it contains the basic components needed to carry a DVI or HDMI signal to the LCD. This uses the native wires and thus opening the neck is not necessary. Personally, I found the 15" screen to be uncomfortably small and have never modded one. The pinout available in this post was provided by modder pgee70. 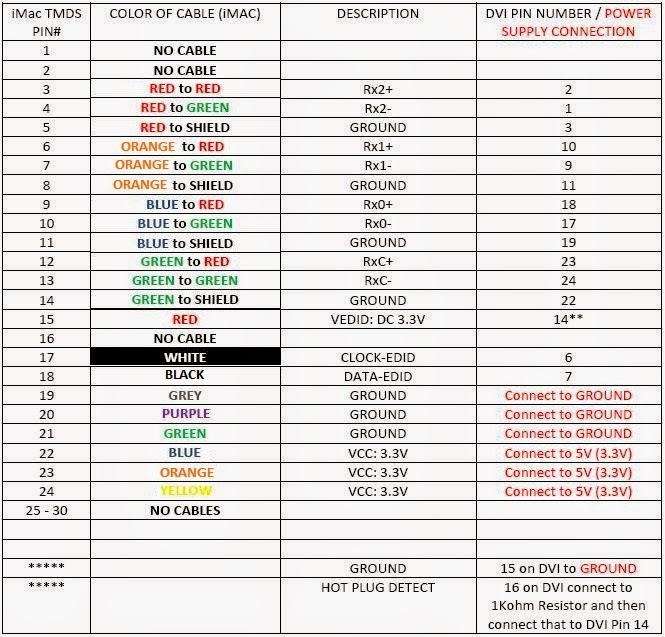 Thus, only the pinout is seen in this post, but the principals are no different from the 17" mod, only the order and color of the wires vary. Use the 17" mod tutorial as a guide, but follow the pinout seen here instead. The 17" iMac G4 is easier to mod then the 20" because you do not have to deal with the complexity of the inverters 24V power requirements. The tutorials provided for the 17" are the most detailed and include video guides. The principle behind all these mods are very similar and I think the 17" Tutorial is a worthwhile review for anyone attempting any iMac G4 Mod. As I was focused on making a 20" for myself, the 17" mod is taken to the the level of getting a DVI cable into the base. If you wish to incorporate an Intel NUC in the base, please see the 20" guide as placing an NUC in the base is essentially the same no matter what the size of the screen. The 17" had processors of 3 different speeds. What took me a while to figure out was that there are 2 different wire layouts/necks. If there is one piece of advise I can give, it would be this: BUY THIS DVI CONNECTOR, the MOLEX PN 74320-4004. I can not put into words how much easier it makes doing this mod. It can be found easily and is available from $2-$5 for several of them. For more details click this hyperlink to my post about it: The Easiest Method. As this tutorial does not really "use" the base, but only uses the LCD and the neck, the power source I used comes from an AC to molex adapter (12VDC, 5VDC). There is really no reason not to use the existing iMac power supply as it provides 12V and with a downconverter or (if making an all-in-one) a USB port of your new computer motherboard/NUC, its easy to get a 5V line. The 5V line in the native iMac comes from downconversion on the motherboard itself and is needed to turn on the LCD. For information on using the native power supply use this hyperlink: iMac G4 17" Power Supply. This is far and away the machine I have spent the most time modding and would recommend (due to the largest sized monitor). I currently have two setups that I use using two slightly different methods, both of which work quite well. 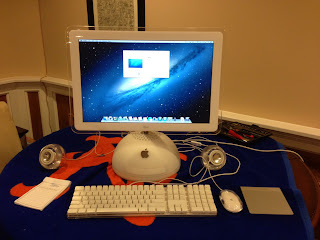 The first is an an external monitor with a iMac G5 modded with an Apple Cinema Display with working iSight Camera and mic (click the hyperlink for information on the iMac G5 mod if you're interested). This mod like the G5 relies on components from a 20" Apple Cinema Display and contains the cinema display powerbrick and a DVD drive (functions as an external drive) in the base of the iMac G4. The second is an All-In-One Hackintosh 10.9 using only the existing iMac parts itself. This is by far the easier of the two and leaves the entire base available to place a small motherboard/NUC. This is also the basis of my tutorial. To better understand these mods, a little backstory. The difficulty of the mod was figuring out the inverter which required 24V in order to work. There is only one neck and the LCD pinout is essentially identical to that of the 1/1.25GHz 17" iMac G4, but I could not get the inverter working, nor could I replace it as it is paper thin and no other inverter would fit in the LCD housing (not even the inverter on the Apple Cinema Display. 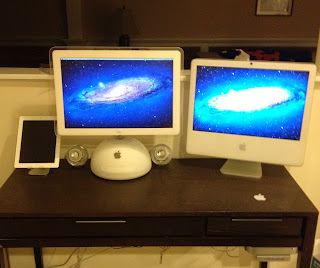 The 20" Apple Cinema Display, The iMac G5, and the iMac G4 use essentially the same TMDS panel (The iMac G4 is made by ID Tech, The others by LG) and are pretty much interchangeable (Though some slight physical modifications to the housing sometimes have to be made for it to fit perfectly). 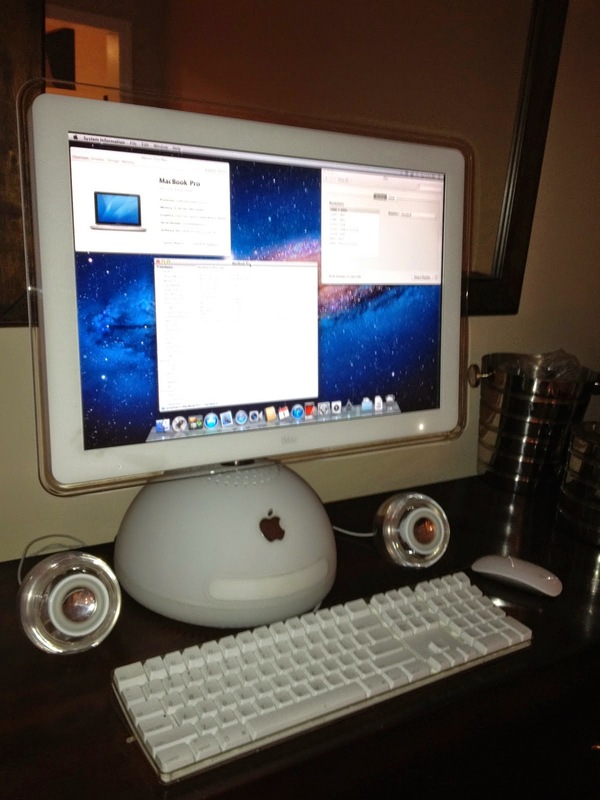 While putting the Apple Cinema Display in the iMac G5 housing, I realized the extent of this compatibility and came up with the idea for the first version of the iMac G4 20" Mod. Initially, I had this mod setup as an all-in-one, but then converted to an external monitor with an "external" DVD drive in the base. I did this because I prefer the mac mini to a hackintosh, but its a personal preference. This mod uses the iMac G4 housing, inverter, and neck, the LCD screen from either the G4 or the ACD, and the controller board, power supply from the ACD. Because there are more wires needed for the ACD, the neck does have to be opened and one wire swapped out for a different wire. The additional wire I used was the LCD signal wires from a different iMac 17" 1/1.25Ghz neck. So obviously, this mod requires a lot more "stuff". It is possible, because the controller board of the ADC works with the iMac G4s inverter. However, there are 8 wires to the ADC inverter and only 7 to the iMac G4 inverter. Luckily, there is a space for an 8th wire on the G4s inverter and it seems to serve the same function. Thus, an extra inverter wire is needed (using one of the extra wires in the neck) for it to function properly. Here are the hyperlinks to the relevant posts. Again, remember, it was written as a journal and I unfortunately do not have a full step by step tutorial, but can give additional information to anyone who requests it. This is obviously a more complicated and potentially expensive mod then using only the iMac G4 20". There are some advantages, however, to doing it this way. As you are using the Apple Cinema Displays controller, it is really an Apple Cinema Display and is recognized as such. With a controller board, you can adjust the image including resolution, brightness, etc. You can not do this when hooking directly into the LCD without a controller. It is also potentially more stable. The controller board also has 2 USBs and 2 FireWire ports which can be utilized and since the controller is extended to the base of the iMac G4, it is easy to do so. Although there are some advantages with the first mod, they aren't big enough that I would recommend doing that mod over this one. This one is much easier and uses only the components of an iMac G4 20" itself, making it much less expensive and wasteful as well. This uses the same LCD pinout and the native inverter, but uses either a 24V upconverter or the native power supply (recommended) in order to supply the necessary voltage to the inverter. In the Step by Step I give instructions on either using the native power supply or upconversion method. Initially, I used a KEEX-6100 ECX board as the motherboard, but then upgraded to the much better Intel NUC Ivy Bridge motherboard, which is vastly superior, as the KEEX was not really intended to be a consumer motherboard. There are other interesting posts about other smallform factors as well as some info about hackintoshes in general. These posts can all be found within this blog. But, these are the most relevant to those who wish to perform this mod itself. The question I most often get is if a new version mac mini will fit and the answer is - no. The posts block it, so the options are currently, an all-in-one hackintosh or an external monitor. Personally, as the mac mini does not take up much desk space, and that I do not find hackintoshes to be overly reliable, I would recommend this approach. Hopefully, apple will one day, reduce the mac mini's footprint, but to date this has not occurred. The Harmon Kardon Globe Speakers are classic and to some (myself included), important parts of the iMac G4's appearance. For information on using these speakers and the ridiculous lengths Apple went to to make these speakers as incompatible as possible. See this post: The Apple Pro Speakers. 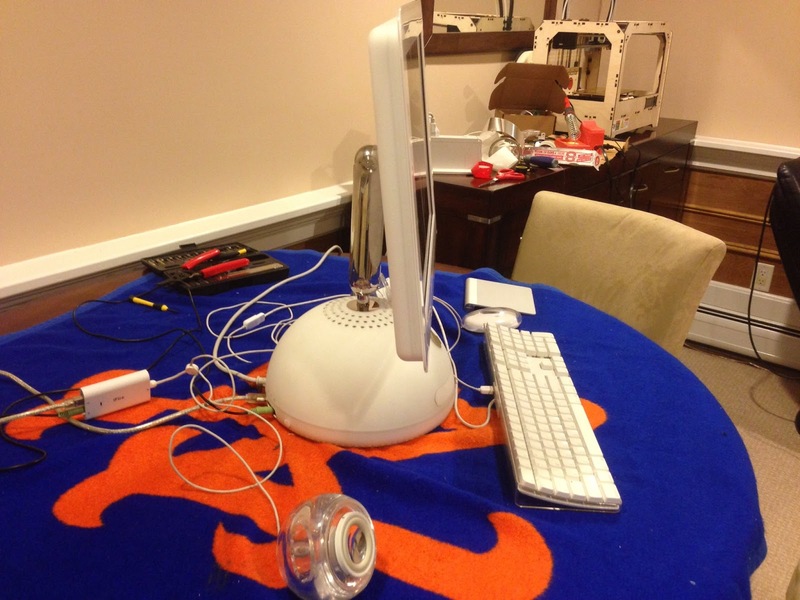 For some general advise about modding the iMac G4, this is probably worth a read: iMac G4 Mod Advise. I hope this helps simplify this site for those attempting to mod their iMac G4s. It is truly a beautiful machine. I am holding off on further mods until more then incremental gains are seen. Redoing the computer for Ivy Bridge to Haswell for instance is not really worth it. A smaller form factor mac mini is really what I am waiting for. Thank you for reading and good luck. My apologies to those that have been unable to access the pictures on this site. It appears that I mistakenly made the pictures that were being pulled into this blog private. I have made all pictures public and I am hopeful that this will alleviate the problem. Please let me know if there is any issue with viewing these pictures. In regards to the future of this project, I have certainly not forgotten about it, but 2 young children and time constraints have made small iterative changes - not worth it. 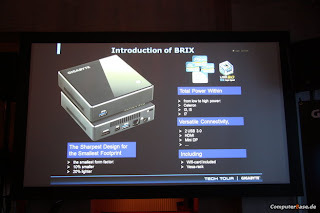 The Haswell updates to the NUC (outside of power consumption) had no noticeable advances to the Ivy Bridge NUC. I have put together quite a few tutorials that are essentially the same. To repeat the project, I am swaiting for a substantial upgrade. 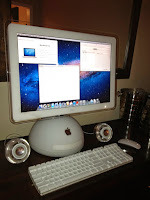 The iMac G4 20" mod (which I prefer over the 17") comes down to two variations that I recommend. 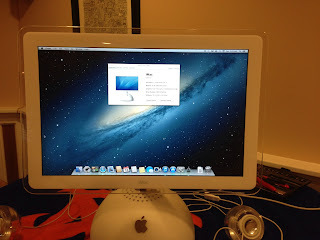 One variation utilizes only the existing iMac G4 LCD and the TMDS signal is made useable by wiring it to a DVI connector. Use of the existing power supply allows the LCD to turn on using a 5V trigger to the 24V inverter. 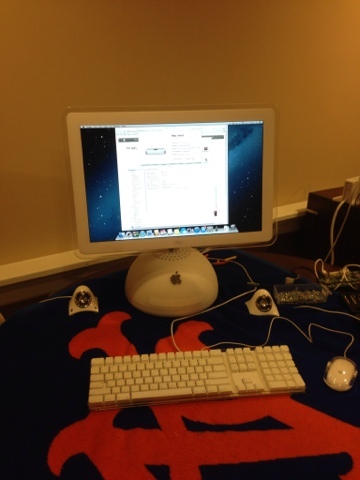 The second is replacement of the iMac G4 LCD with the 20" Cinema Display. This keeps the original inverter, but adds the Cinema Displays control board to the base. This mod is made more difficult by having to change some wires in the neck. However, if you can open and close the neck without damaging it, this mod is potentially more stable as it utilizes everything as intended. It turns the G4 into a Cinema Display in disguise and gives you the power and brightness control afforded by the cinema displays control board. 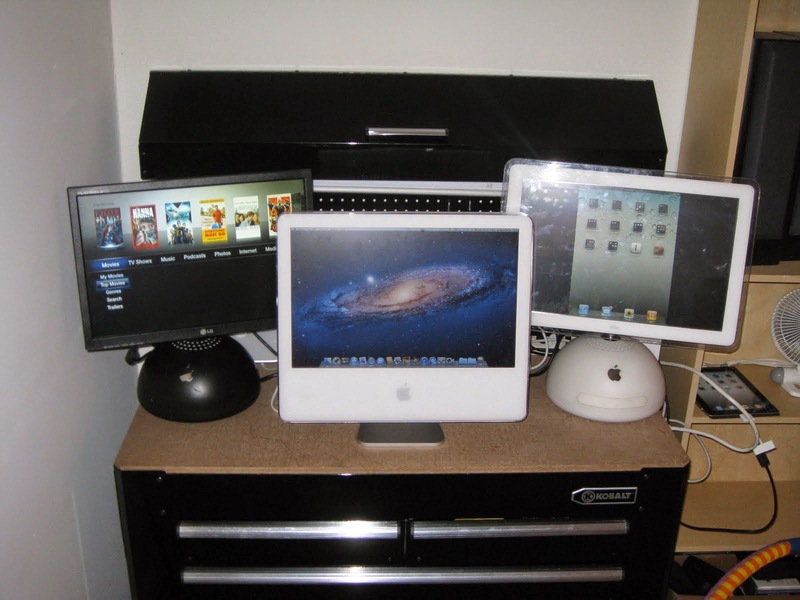 This also utilizes the cinema displays power supply instead of the native iMac G4s. Either mod results in the lcd and neck becoming an external dvi/hdmi compliant monitor. The base will loose some space to either the native power supply or the Cinema Displays control board (the power brick can be internalized or externalized). What goes in the rest of the base or externally is really a matter of personal preference. There just needs to be a 5V trigger from the computer to turn on the monitor. This can come from a USB port or the outgoing video DVI itself. There are 2 ways I can see to substantially improve these mods. The first addresses the major issue that I have with me all in one Ivy Bridge Mod - Native OS X.
I have never been fond of hackintoshes. I do not like having to worry about installing upgrades and can not use a machine as anything more than a hobby if there is a chance it could brick with an update. Unfortunately the latest mac minis simply do not fit without dramatic modifications to the base. I keep hoping that apple will release a Mac mini form factor that substantially shrinks down its current length and depth. If it does this makes a new mod a no brainer. The second improvement would be an LCD upgrade. This is much trickier as the 20" 16:10 form factor is no longer made and in fact no LED backlit variations of this size and aspect ratio has ever been produced. Thus, the entire chassis would need replacement. I have looked at alternatives from apple including the 24" LED and 21.5" iMac. While the newer iMacs look only slightly silly on top of the base, the gargantuan 24" looks ridiculous. I have not yet found a chassis that I like though have settled on a 21.5" 16:9 thin bezel (preferably LED and touchscreen) as the best fit. The issues that come up with this include the look. (White is preferable and no white plastic monitors that I've seen have the right aesthetics). 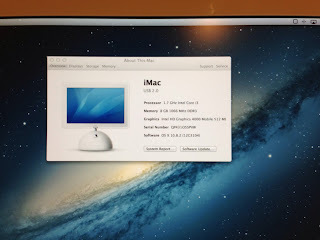 Even with the right monitor, connecting it to the iMac G4s arm and utilizing the existing cables or replacing them represents a challenge either way. I have even thought about custom 3D printing a new 21.5" with neck attachment chassis in the style of an iMac G4, however, I am then worried about the effect it would have on the arms which is so perfectly balanced to the existing monitor housing and LCD. I have also considered an all in one (as they are not much larger than monitors in many cases) thus eliminating the need to route anything through the neck other than a power cable and possibly USB. However, putting an all in one on top of an empty base may take away what makes the iMac G4 so special in the first place. Nevertheless, I remain on the lookout. Thank you to all my readers and I apologize again for the picture problems. After completing my latest mod, I promised a guide. Due to personal reasons, I have not had a chance to work on this. As time goes by and it is less fresh in my mind, it becomes somewhat more difficult to compile. While all the information to do this mod is within this blog, it is not very well organized. The Monitor to DVI instructions are contained within the 20" Sandy Bridge Guide. While I talk about the native power source in this tutorial, I use a PICO power supply in this actual mod. The native PSU is really discussed in a different post. Likewise, wiring up the new NUC board is in a different post altogether. I had initially constructed this site to be a "Tech Journal/Diary" where the most recent updates would be chronologically first and older entries could contain outdated or incorrect information. 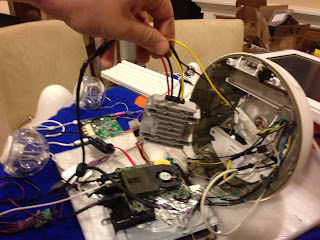 As I became more involved in the iMac G4 project, this site became more of a guide/tutorial site. While this isn't a bad thing, its just not exactly how it was designed to be. As I've been putting together the tutorial for the 20" Ivy Bridge NUC Mod (in the form of audio over pictures), I've realized that this may be the opportunity for a "redesign". I would like to keep this site as my tech journal site. Even the failed mods and the process behind them is something I would like to "preserve". I have secured "imacmods.com" and I am hoping to eventually link between these two sites for a more cohesive and straight forward experience. Someone wanting to know how to connect the native PSU can click on it and either go to a written tutorial, video guide, or original dremel junkie post. It is certainly not lost on me how confusing it is to google "iMac G4 Update" and think you've found the answer only to find several posts detailing somewhat related (but not the same mod). Also, from my end, I have step by step photographed, documented, and wired up two different 17" necks (one on video) and a 20", and am now going to repeat it again for the 20". This will allow me to have a "modular" approach where 'for instance' STEP B: Conversion to DVI remains the same regardless of which computer you use in the base. I would greatly appreciate any advice from those more skilled than me at web site creation. I would like it to be simple and easy to follow, but am a novice at this. Please let me know if you have any suggestions. This NUC based system is smaller, lighter, has more I/O options and will have i5 and i7 options. 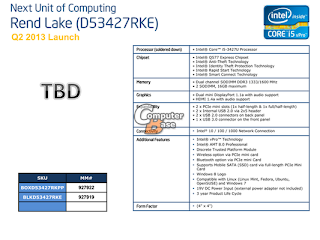 While initially Ivy Bridge based, Haswell is likely not far behind. Rend Lake will be i5 and USB 3.0 capable based of Ivy Bridge Architecture. In retrospect the use of Thunderbolt was a waste on the initial NUC. Initially I thought it would be "future proofing", but its been months later and the only intriguing peripheral is Belkin's (finally being released) $300 Thunderbolt dock. Of course, its the USB 3.0 that makes this dock interesting. 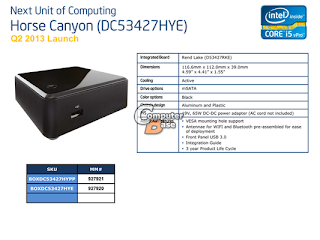 Thus, this NUC should be far more versatile (at least I hope). I am unsure of the variation in the "Horse Canyon" Core i5, it doesn't appear to use a Haswell Chip, though I can not be sure. 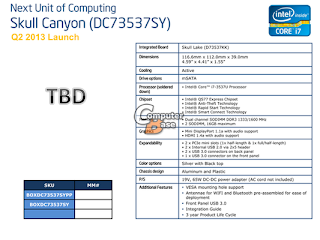 "Skull Canyon" is the Core i7 Variant, and the one for which I am most excited. Of course, updates are always going to happen, and while these are only incremental upgrades, I have been looking for an opportunity to add USB 3.0 in particular (and get rid of the thunderbolt). As these seem like they are "around the corner", I am asking for patience in terms of the guide. Replacing the board is not difficult, but it would make more sense to only disassemble and reassemble this mod once. So please stay tuned and hopefully the tutorial will be done shortly, with an even more powerful NUC serving as the computer. Some of you may have noticed an"incompatibility" with certain sources. Sometimes this is due to playing digital protected content "HDCP" or even using certain motherboards. For myself, the EPI-QS77 and I am told the Raspberry Pi as well, seem to cause incompatibility issues. In some cases, changing from DVI to HDMI and back can remedy the problem, other times, artifacts persist in the monitor. My guess is that some boards may have an incompatibility with the "EDID", the identifier of this LCD. While there is no direct way around this, there is an "indirect way". As I have mentioned before, prior to figuring out direct wiring of the existing LCD, I had found a work around. 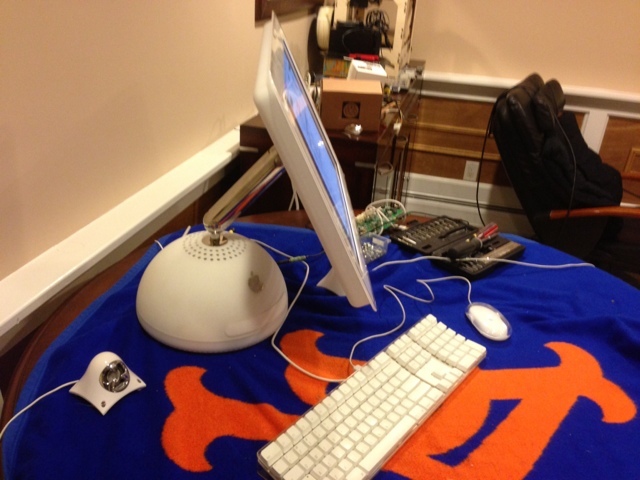 This "work around" is used in the iMac G4 (pictured above) and although its just serving as a monitor (with a modded iMac G5), I have now been using it daily for over 2 years without any problems whatsoever. This work around keeps the native inverter and can keep the LCD or use an LCD from an aluminum Apple Cinema Display or iMac G5. 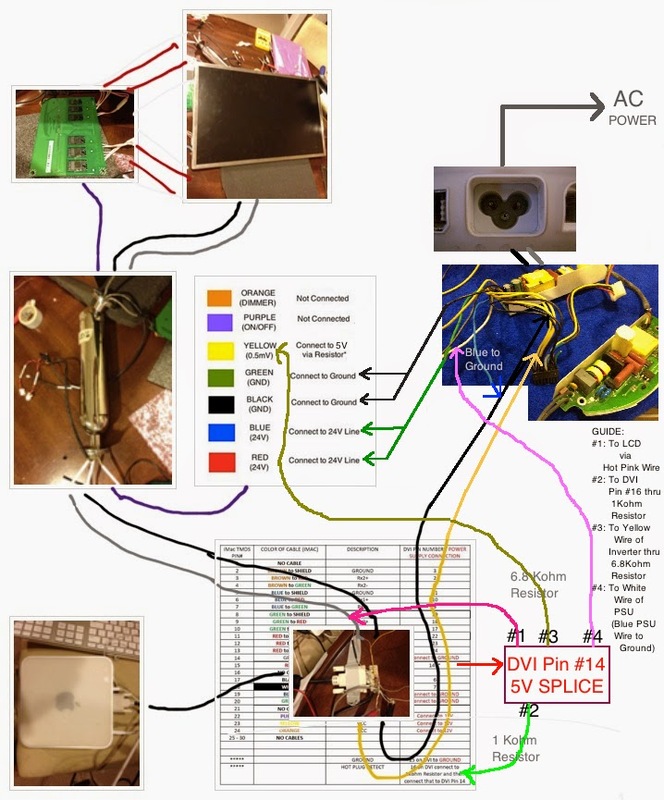 The most important thing is that this uses the controller board from an apple cinema display. While this does involve opening and rewiring the neck, it does give the LCD a true EDID and HDCP compatibility. There are certain other advantages as well, but it is more technically challenging and will require some parts from a cinema display. I mention this only to gauge interest. Are there people who have experienced this problem? Are people interested in this particular method? Thank you all again for your patience and thank you for taking the time to read this. So that pretty much completes this mod. I have thought about new HD 21.5" LCDs to the top of the arm in a custom LCD case that mimics the iMac G4, but I am not sure that would add very much. This monitor falls just short of HD and I have not had any issues with it in terms of quality. Though its something to consider for the future. I find that larger monitors start to look "awkward" with the base. Although placing the Cinema Display on the top of the monitor worked. It wasn't until I went back to the original that I realized it was "off". It didn't droop or tilt, but it didn't move as smoothly as the original. The neck was obviously designed very specifically for the native monitor. This includes not only the weight, but the thickness and shape as weight distribution changes as you tilt and swivel the neck. Unfortunately, without the R&D budget of apple, its hard to design a new neck, but the old one works beautifully with the native LCD. I would still like to make this into a touchscreen and perhaps add an iSight. The awkward size and Mac compatibility issue make this difficult. While I have a capacitive screen that works, its thick and heavy and would require dramatic hardware changes (LED lighting with custom thin diffuser) or physical changes (altering the LCD case and front bezel). I am still hopeful that touch films will eventually be readily available, adding touch capability of any size with negligible cha ges in thickness. Anyway, I'll worry about that later and enjoy this computer for a while. I have tons of pics from this and previous mods, as well as the ability to fill in gaps with surplus materials. As such, I'm thinking about putting together a "Moving Picture" Video Guide. Sort of a compromise between a written and video guide. I'll be able to explain from start to finish, step by step, how to do this with audio and annotated pics. Let me know if this sounds at all interesting or useful to anyway. Thanks for reading/watching. While the previous Sandy Bridge Mod worked fine, this board is simply a perfect fit. It runs cooler, uses less power, keeps the optical drive, supports mountain lion, uses the native PSU (which not only ditches the external power brick, but it even provides 30 extra watts of power). This is much more stable. Only S3 sleep (S1 works fine) remains a problem. The two extra additions are the 12V to 19V upconverter, which powers the actual motherboard. and the Wide Input PSU, which allows the peripherals (The optical drive and the Fan) to turn on only when the motherboard is on and activates the PSUs 24V line via its 5V switch. Both these fit (although its tight) and work perfectly. With the exception of some cosmetics, I have completed the back ports. They include 4 USBs, though 1 is used by a small Bluetooth adapter, a 3.5mm audio jack, the native AC power plug, and a "fake" Firewire 400 plug. 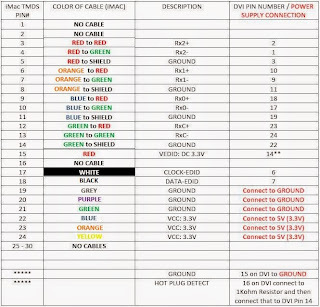 Its fake because it isn't a true firewire cable, it is only connected to a 12V Molex/Ground, so it supplies only power. This is for use with the Griffin ifire adapter which gets its power from firwire and its signal from a 3.5mm audio jack and has an apple minijack out for the apple pro speakers. This is very much akin to the original apple pro speakers that came with the G4 Cube. They used an external amp which plugged into a special "high voltage USB port". So although the speakers are not directly plugged in like the original, with the iFire, no additional power source is needed. I did not want to break open and try to internalize the iFire. This would have wasted the valuable iFire and constrained this mod to only those speakers. The iFire also allows lengthening of the speaker cable, which is far to short on the apple pro speakers. Using KeyMap4Macbook to allow the keyboard button to eject the SATA to USB drive. 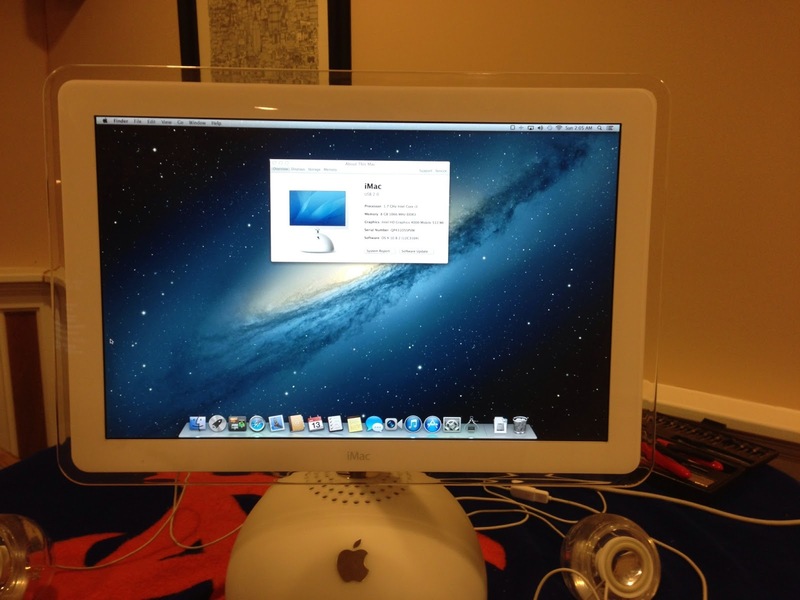 Changing the Mac Mini Pic in Resources to the 20" iMac G4, so the iMac's pic displays in "About this Mac". I will do a video shortly and am hoping to combine old pictures and new pictures into a comprehensive guide for doing this, including parts list. Almost all the shortcomings of my previous mod has been addressed. I am really pleased with this and hope this is helpful to others interested in this mod. Thanks for reading! I still have to improve the cable management at the bottom of the dome. The ports on the back need to be completed an I have to make a final decision regarding audio options. I am quite amazed at how well this mod worked. I will of course give a more detailed description shortly. 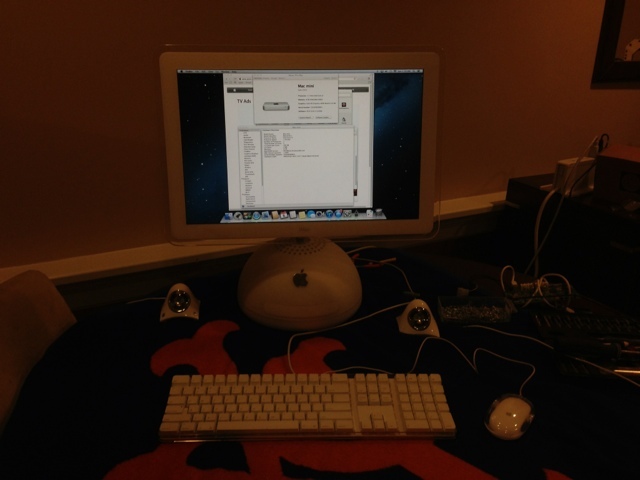 20" iMac G4 NUC/AiO Ivy Bridge Mod: SUCCESS! I'm happy to report that all problems have been solved and the motherboard fit test was successful. This is currently the method I would recommend for those that want a 20" Ivy Bridge Hackintosh version of this mod. As I noted in my previous post, while I initially believed I would not go in the direction of the NUC board, its remarkably small size and simplicity made it by far the best candidate for this mod. In multiple previous posts I have explained the advantages of having the core elements (processor/motherboard) of the mod at the top of the dome where ventilation is best. In my previous ECX mod, the board only fit with the optical drive because I did not use the native PSU. Because I wanted to use the native PSU, I did not believe fitting the optical drive was possible, but with this board it looks like it is going to fit. (Although nothing is definite until this is completed). This board fits into the slot left vacant by the 3.5" HDD (the mSATA is on the mobo itself). It pretty much fits into the grooves in the drive chassis requiring no alternation. For comparison, I have taken side by side photos of the original optical drive and HDD in the drive chassis next to the shorter new dvd optical drive and the NUC occupying that area. The height is pretty much the same and there is amble room for the connectors to fit as well. 1) USB Ports: A 4 port USB Hub leaves me with only 1 spare USB port, but solves the problem. The addition of another hub or a larger one is likely. A USB port supplies the 5V to the PSU. 2) The Fan: The directional fan is connected to the heatsink and I did not want to remove it. I also wanted to keep the case fan. Apple's connectors and colors are completely backwards from industry standards (Black is 12V, Red is Ground and the fan out is a 3pin Male connector, not Female). The fan is also somewhat loud and old, so I decided to replace it. I bought a Antec 92mm fan that had a molex out (there is no case fan output on the board). There is a sense pin that I won't be using. Because I won't have software fan control, I got a model with a 3 speed setting. I put it on medium to reduce noise and may extend the controller to the back ports or simply leave it on this setting. While 12V are readily obtainable from the PSU, the problem is that the PSU is always on. So, the fan will spin as soon as the computer is plugged in, no matter if the computer is on or not. As the computer does not have any 12V out, I will have to use some kind of switch. Luckily, the PSU comes natively with a "switch". The PSU relies on the motherboard to downconvert 12V to 5V then feed 5V back to the PSU to turn on the 24V line that powers the monitor's backlight. Although there are many other ways to do this, I went with an elegant solution using what I had available. Keep in mind this is not the only peripheral that needs power. The optical drive requires 12V and 5V in either a molex or SATA power connector. Luckily, I had a very small 20 pin PICO power supply with a WIDE INPUT range up to 24V. (Not all PICO PSUs can accept 24V, may sure before you connect). I spliced the PWR input to the Green wire of the PSU (24V) which connects to the Inverter Wires as well. I connected the ground to a native PSU ground. As this is a standard 20 pin ATX based PSU, it won't work without a motherboard unless you ground the On Pin. I have it connected to a switch, but will likely just leave in a wire, allowing the PSU to turn on as soon as it receives 24V DC input from the native PSU. This produces the necessary 12V and even a 5V and has both a Molex and SATA power cable out. I connected the Molex to the Fan (you only need the 12V line and ground), and the SATA to the optical drive. Now we the peripherals will only turn on when the motherboard itself is turned on. 3) Power Switch: I did not want to damage the board, so I simply threaded small wires between the onboard switch and its solder points. I did this to the front right and back left corners. This was then wired to the case switch at the bottom of the dome. These can be easily removed in the future if this board is ever repurposed. In addition this does not effect the functionality of the original switch in any way. The case switch I use is from my previous mod. Modeling clay was used to secure a momentary switch directly behind the peg that protrudes from the back of the plastic power button on the back of the iMac dome. 4) Audio: I am sticking with the Turtle Bay USB Audio solution from my last mod. This allows for a standard 3.5mm audio jack out and also supports a 3.5mm Microphone in. I have it wired to the microphone in the LCD housing. 5) Bluetooth: I have not found anyone who has had success with any half height mini PCI-E that supports Wifi and Bluetooth with Mac OSX. So, I am simply going to keep my very small USB bluetooth solution. 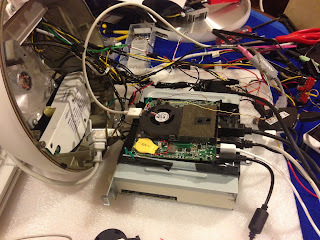 6) Optical Drive: I am using a DVD Burner that gets power via the PICO PSU discussed in #2. The connection to the mobo is via a SATA to USB 2.0 adapter cable. 7) Power: While the option of splicing the AC to the to the existing AC plug with the NUC's powerbrick is not a bad one, it is somewhat of a waste of the 180 watt PSU that already exists in the machine. Not to mention that I'm already including a second PSU (which is really being used only as a downconverter here). The NUC requires 19V at (at least) 3.7A and the PSU is only supplying 12V (can't use the 24V because its only on with 5V from the motherboard). Luckily, 19V is the typical notebook operating voltage and therefore upconverters are available. Though there is a much smaller selection than for more common voltages (24V, 12V, 5V etc). Many different shapes an sizes are available. I got one in a familiar shape on ebay from a Chinese manufacturer for $20. Its relatively small ( I may remove part of the heat sink surrounding it) and is a 12V DC to 19V DC upconverter at 4A. This is exactly what is required and works flawlessly. The Upconverter gets 12V and Ground in from the Native PSU and sends 19V out. I had a broken Laptop AC power adapter that had a DC input that perfectly matched the power in plug on the NUC. The positive is the inside peg and the negative is the outer part. Using a multimeter I ensured which wire was which and connected this to the power supply via the up converter. On a side note, I used a rubber sleeve to cover the drive cage where the NUC will go. After some guess and check, I determined the place where the NUC and USB connectors seemed to fit the best. To test fit, I used twist ties that went through the screw holes in the grooves intended for the HD and then through the motherboard screw holes. These will be replaced with plastic locking ties to secure the motherboard in place. One thing to make sure of is that the wifi antennae which goes through the metal faraday cage (Wifi signal will be severely reduced if the antenna is within the cage) is connected to the wifi card before the board is secured. Obviously, there is a lot of cable management to do. This will get much simpler once connections are directly soldered (connectors removed and alligator wires eliminated). As I technically have more room at the bottom of the dome than the previous mod (also had a DC converter and a PICO PSU to deal with), I do not believe this will be difficult to fit. The wire management, however, may be more involved. There will a paucity of ports. A 3.5mm audio out, a few USBs, and not much else. If I had to do it over, I probably would not have bothered spending the extra money on the Thunderbolt equipped version. There are so few available peripherals and there are so overpriced that I can not even test this. Perhaps this is somewhat future proofing, but I would imagine there will be further upgrades to this board before thunderbolt actually takes off (if it ever does). That said, I would not have bothered with an ethernet extender anyway. I've learned with this that the more you do, the more that can go wrong. I am more than happy to keep it simple. I also have the option of adding a powered USB hub with the 12V lines in the PSU. Unlike my previous mod which was very close to its power maximum, this should have room to spare. Untili I have it assembled and have worked with it for a while, I'm cautious about speaking too soon, but I am very optimistic about this project. Although to Core i5 Sandy Bridge to a Core i3 Ivy Bridge may seem like a lateral move, this board is simply a better fit. Its lower power, quieter, and everything onboard works. The incorporation of the native PSU while keeping the optical drive makes this virtually indistinguishable from the original 20" iMac G4. Hopefully will finish soon! Thanks for reading.